Embed a Questionmark Perception survey or quiz in your Drupal page. To see how this would look, see a snapshot of an assessment embedded within a Central Desktop wiki workspace. Drupal is a free, open source Content Management System (CMS) written in PHP and distributed under the GNU General Public License. It allows an individual or a community of users to easily publish, manage and organize a wide variety of content on a website. Your assessments can be embedded in your Drupal page through an IFrame. To see how this would look, see a snapshot of an assessment embedded within a web page programmed using Flex. Flex is a free, open source framework for building web applications that deploy consistently on all major browsers, desktops, and operating systems by leveraging the Adobe® Flash® Player and Adobe AIR® runtimes. Flex is a development platform. It can be used to make anything from websites to installable applications using the Adobe Flash Builder™ . Embed a Questionmark Perception assessment, survey or quiz within Joomla. 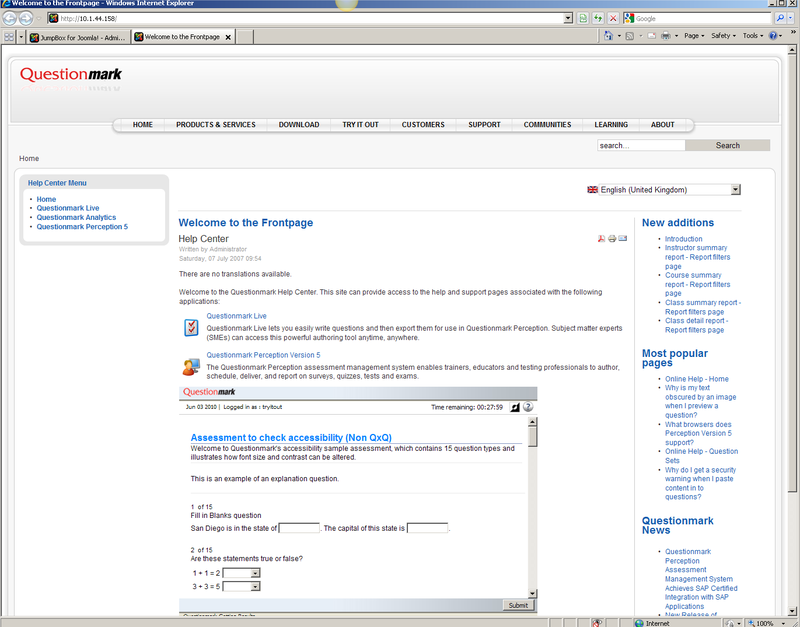 To see how this would look, see a snapshot of an assessment embedded within a Joomla page. Joomla is a free and open source content management system (CMS), which enables you to build Web sites and powerful online applications. 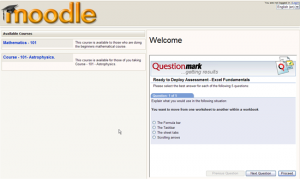 Embed a Questionmark Perception assessment, survey or quiz within your Moodle page. 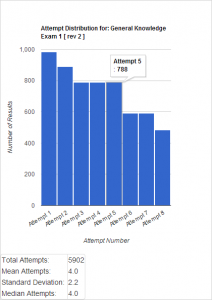 To see how this would look, see a snapshot of an assessment embedded within a Moodle page. Moodle™ is an open-source e-learning software application that uses a modular design, and is designed to help educators create effective online learning sites. 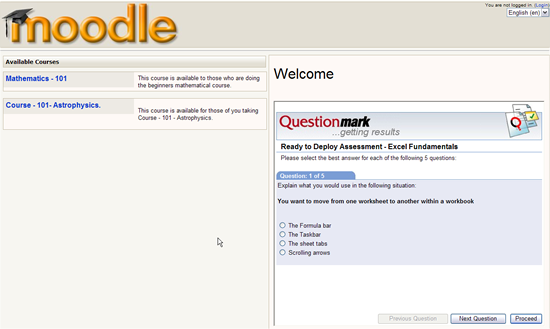 Moodle is free to download and use, and can be run on Windows, Mac OS X, UNIX, or Linux servers. 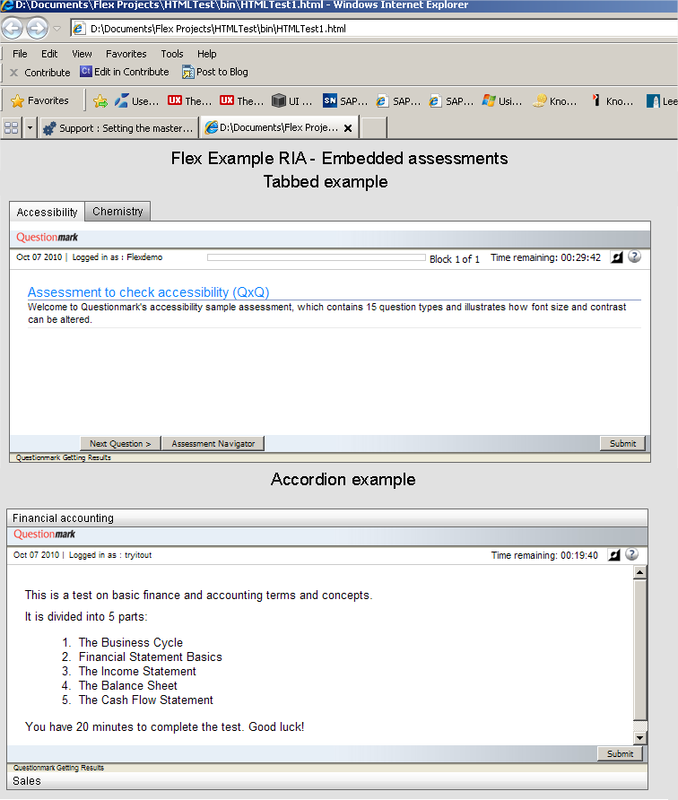 You can easily include your Perception assessments within Moodle in various ways. Last month I wrote about our new Community Edition program under which we’ll be releasing selected integration products as free-to-download Community Editions distributed under open source licenses. Although this program represents an exciting new way to involve the development community, Questionmark is no stranger to working with open source. Moodle is a popular learning management system that is developed by an active community of open source developers. Questionmark has always distributed its connector products for Moodle under a similar open source license, so it is no surprise that our new connector for Moodle 1.9 is available as a Community Edition. The connector is written in the widely-used PHP system used by Moodle itself and uses QMWISe (Questionmark Web Integrated Services Environment) and PIP (Perception Integration Protocol) to allow Perception tests to be included as activities directly within Moodle courses. You can find our more information about the connector and the development project behind the Community Edition from our new developer site: developer.questionmark.com. On the site, you’ll find information about our Application Programming Interfaces (APIs) and all of our Community Edition projects. The Community Edition Moodle Connector page on the development site also links to the development project, which is hosted on the popular SourceForge system where you can download the latest version and even browse the code! And finally, we’ve used Moodle as a development platform for the developer site itself, which means that we can demonstrate the connector working directly from the site. Look for the “Try It Out!” section on the Community Edition Moodle Connector page and see if you can answer my quick quiz on the main features of our Community Edition release program.